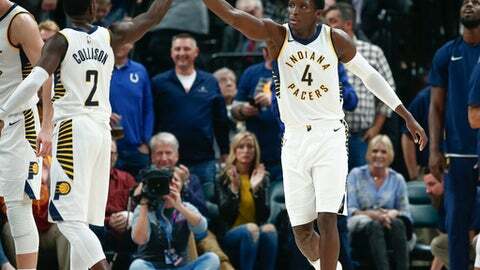 INDIANAPOLIS (AP) Victor Oladipo took a big step toward stamping Indianapolis as his town Sunday. All it took was one clutch shot. The Pacers’ new starting guard knocked down a step-back 3-pointer with 10 seconds left to complete a late rally and give Indiana a rare 97-94 victory over San Antonio. In Indiana, game-winners have been hard to find lately. Four-time All-Star Paul George had 15 go-ahead shots in the final 20 seconds of games during his career with the Pacers – and missed all 15. Oladipo had no trouble making the first with his new team. ”We try to come in every night and prove that we’re not just those players who were in the Paul George trade and that we actually mean something,” Sabonis said after again replacing the injured Myles Turner in the starting lineup. They helped offset LaMarcus Aldridge, who finished with 26 points and eight rebounds, and Pau Gasol, who had 17 points, seven rebounds, five blocks and five assists. San Antonio’s second straight loss will force coach Gregg Popovich to wait at least one more day to tie Phil Jackson for No. 6 on the NBA’s career victory list, too. But when the Spurs opened the fourth quarter on an 18-5 run to take an 82-73 lead with 6:44 left, it looked like the Spurs might run away. Instead Sabonis and Oladipo spurred a 16-3 spurt that gave Indiana an 89-85 lead with 3:06 left and a couple of possessions later, Oladipo broke an 89-89 tie with a three-point play. Danny Green answered with five straight to give the Spurs a 94-92 lead, but Oladipo hit the long jumper to put Indiana ahead for good. Aldridge’s 19-footer with 5 seconds left bounced off the rim, Cory Joseph grabbed the rebound and drew a foul and made two free throws. Patty Mills’ 3 from the corner at the buzzer was way off the mark. Spurs: Shot 40 percent after making a season low 33.7 percent Friday at Orlando. … Aldridge has led San Antonio in scoring in all six games this season. … Kawhi Leonard and Tony Parker continue to miss games with quad injuries. … Manu Ginobili was 0 for 6 from the field and 0 for 2 on 3s and had three points. Pacers: Turner missed his fifth consecutive game with a concussion. It’s not clear when he’ll return. … Indiana and San Antonio each finished with 44 rebounds. … Sabonis has had 11 or more rebounds in four straight games. The Indiana Pacers honored their newest Hall of Fame member, George McGinnis, at halftime. ”To have three guys, three players from the same team and a coach in the Hall of Fame, I think that tells you how good our team was,” McGinnis said. He was referring to former teammates Mel Daniels and Roger Brown, both of whom have died, and coach Bobby ”Slick” Leonard, who is the team’s color analyst on radio broadcasts. Popovich seems to enjoy reliving his past when he gets back to Indiana. The longtime Spurs coach played high school basketball in Merrillville, Indiana, which is located in the northwest corner of the state. Before the game, Popovich was shown a photo from his prep days and was asked about his career. Pacers: Will seek a straight win in the Sacramento series Tuesday at home.